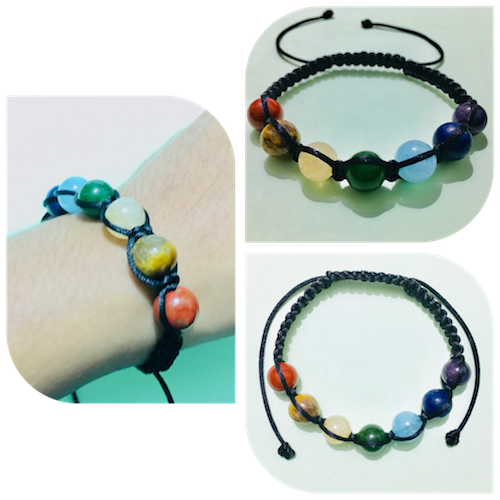 Buy authentic chakra bracelet from NatureOz, the leading online crystal shop in the Philippines. Our adjustable chakra healing bracelet is made from high-quality waxed cord and adorned with genuine 10mm crystals beads that represent the seven chakras. This is designed to improve one’s health - be it physical, emotional, mental and spiritual. Red Jasper: Enhances physical strength and stamina. Cleanses and stabilizes aura. Yellow Tiger’s Eye: Boosts will power, emotional stability and energy levels. Citrine: Attracts love and happiness. Known as the stone of abundance and manifestation. Green Jade: A crystal of love, it promotes trustworthiness and fidelity. Guards against illness and sudden death. Aquamarine: Improves communication skills. Promotes harmony, commitment and fidelity in romantic relationship. Lapis Lazuli: Promotes wisdom and good judgment. Amethyst: Protects against psychic or spiritual attacks.